Our commitment to your weight loss goes beyond traditional dieting. Our mission is "To encourage cancer patients and families on their journey by offering HOPE through emotional and spiritual support. Dr. Rieger specializes in breast augmentation, breast lift, breast reduction, tummy tuck (abdominoplasty), liposuction, and facial plastic surgery. Lash lounge and clean skin care boutique located in College Hill at Clifton Square. 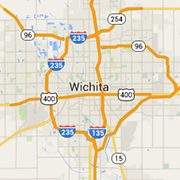 Providing hair styling, cutting, coloring, hair extensions, and waxing services to the Colwich and Wichita area.